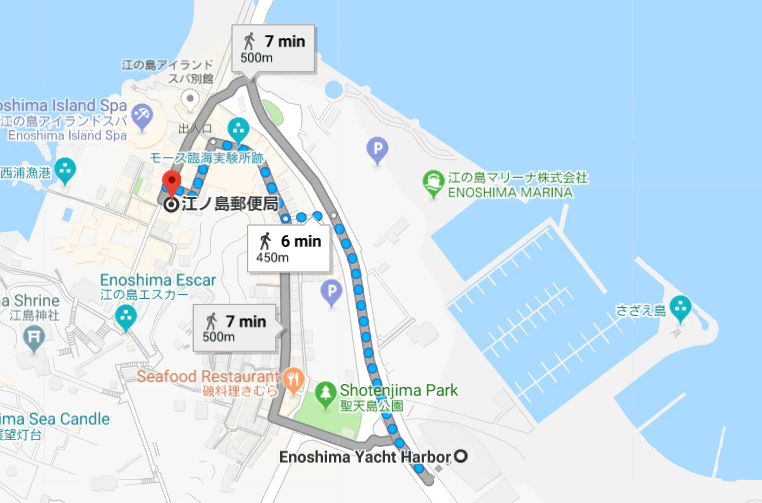 Sailors, coaches and any other members of a national team are requested to follow the local rules of the Enoshima Yacht Harbor. During a race event, however, if there is a separate set of rules set by the race organizer regarding the use of the harbor, the organizer’s rules supersede the local rules during the term of the event. Enoshima Yacht Harbor is a public harbor. Please follow its instructions and clean up after yourself. When there are many other general sailors, please use the facility with a give-and-take spirit. Thank you for your cooperation. 1. First Thing to Do: Bringing your dinghy(ies)/boat(s)/board(s) into the harbor and storing it/them. a. Fill in an application form given at the Harbor Office, and complete the required registration procedures for your berth(s). b. Your dinghy(ies) must be kept at the designated berth with the ID plate given at the Harbor Office tied to the trolley of your boat. c. Your windsurfing board(s) must be kept at the racking space designated by the race organizer with the given ID plate tied onto the upper pipe. ※ Please be noted that use of windsurfing boards is not allowed under the general local rule of the harbor. It is allowed only for specially permitted events, such as a pre-Olympics competition. d. Your coach boat(s) must be kept at the designated berth/place with the given ID plate tied to the boat. e. If you are chartering a dinghy(ies)/boat(s), the above procedures may be handled by the lender. Please confirm who will take the procedures with the lender before you come to the Harbor Office. f. Please keep your boat(s)/dinghy(ies)/windsurfing board(s) at the harbor at your own risk. Be sure to tightly secure your boat(s) /dinghy(ies)/ windsurfing board(s) with ropes or other appropriate means so that the boat stays safe against any strong wind. g. To secure dinghy(ies), use the mooring rings set at the four corners at your berth. Be sure to use two separate ropes, one in front and the other on the back. If you keep the vessel with its mast down, make sure it won’t stick out onto any pathways around the boat. Please be aware that there is always a possibility of a sudden strong wind caused by a strong low pressure system or a typhoon. ・Windsurfing board(s) <on a rack>: Please ask the organizer. •The paid fees are non-refundable. 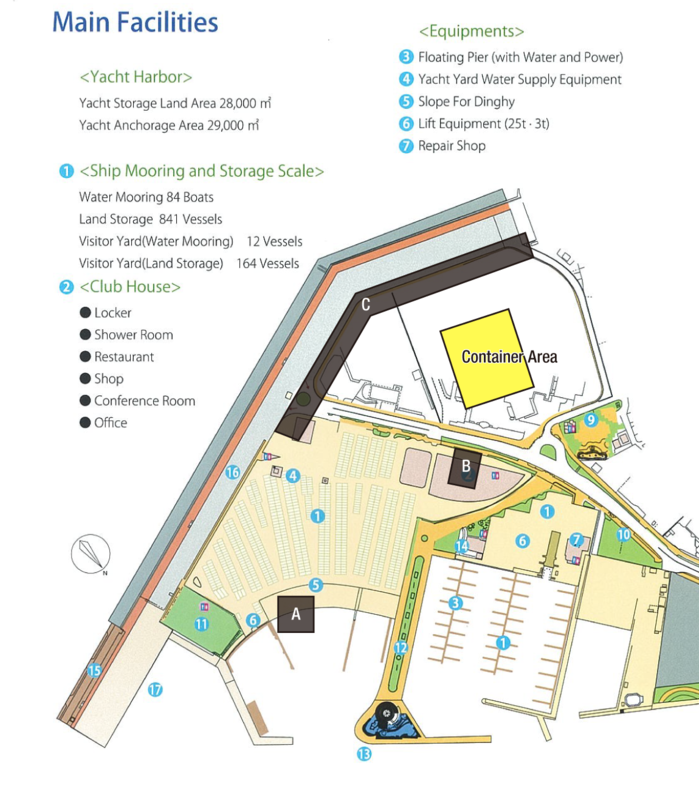 Please confirm with the race organizer whether the berth/storage fee is included in the entry fee before you settle your payment at the Harbor Office. •Credit cards are accepted for payment of the storing/crane fees. 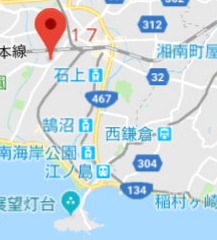 •There is ATM in the Enoshima Island as shown below. Available time Monday-Saturday: 8:00a.m.-9:00p.m., Sunday: 8:00a.m.-8:00p.m. a. Crane is not free of charge. Please make payment and receive the ticket at the Harbor Office, and give it to the crane operator. ・Summer time (July & August) and weekends in June: 8:00a.m.-12:00p.m., 1:00p.m.-6:00p.m. ・The rest of the year: 8:30a.m.-12:00p.m., 1:00p.m.-5:00p.m. d. Maximum boat weight is 2.9 tons. The use of crane is limited to coach boats (RIB) less than 2.9 tons. e. When you use the 3-ton crane, please use the sling system of your own boat. Use of the sling belt attached to the crane may damage the rubber part of the boat. f. Dinghies and RS:X must use the slope at all times. a. Currently, there is no fuel station in the harbor. b. Please purchase petrol from a nearby gas station or marina. a. The Harbor is closed on Tuesdays except the summer time (June, July & August). b. 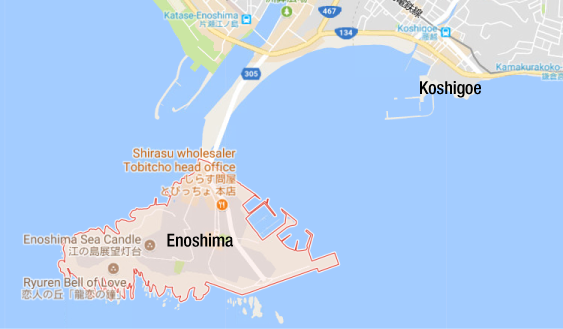 You may work on maintenance of your boat(s)/dinghy(ies)/board(s) onshore if you submit “Notification of Entry to Port of Shonan Outside of Designated Hours” in advance, but you may not practice sailing when the harbor is closed. c. Your practice time is limited to the office hours: Harbor Office opening hours: 8:30a.m.-5:00p.m. Summer time and weekends in June: 8:00a.m.-6:00p.m. a. Be sure to fill in the Sign-in Sheet at the Harbor Office before you sail out from the harbor. b. As you sign in, you receive an orange flag with a number. Please write the number of the flag on the Sign-in Sheet. c. The orange flag needs to be attached to the dinghy(s)/boat(s). d. As for windsurfers, please ask the organizer for their Sign-in/Sign-out system. e. Before you leave the harbor for the day, please return the orange flag at the Harbor Office and sign out. If the Harbor Office finds a flag missing at the scheduled returning time, they may take the procedure to start searching considering you are having a trouble at sea. You must wear a life jacket at all times at sea, from the time you leave the harbor until you return. Please ensure an enough distance from the lighthouse as there are many anglers throwing long fishing lines and reefs on the southern side. *Please pay attention to fishing vessels as there are many in the area off Enoshima. a. 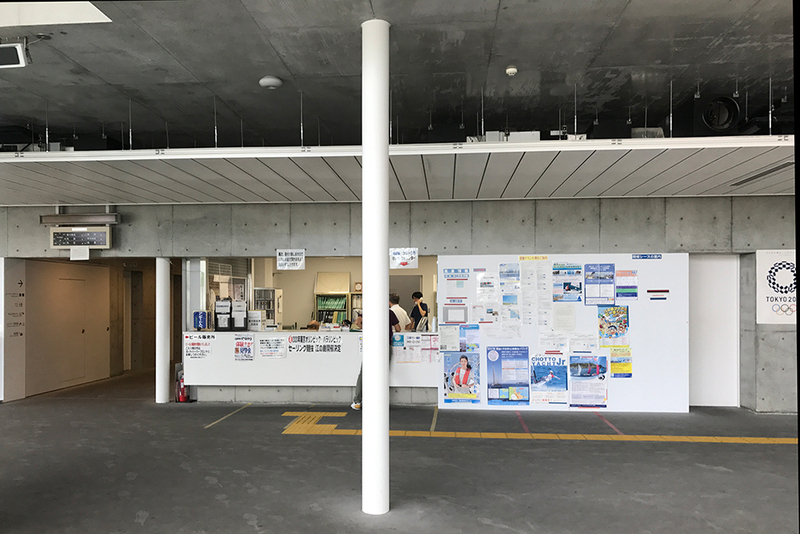 Please pay ¥220 at the Harbor Office and receive a locker key. The locker is available only when you take a shower, and not for storing luggage for a long time. b. Dressing room is free of charge. c. Do not leave your belongings unattended on the floor or table in the locker room. d. Coin-operated lockers for valuables are located on the left side of the Harbor Office. Pease pay 100 yen per use. a. Larger lockers are located at a separate building next to the Yacht House (the main building where the Harbor Office is located). Please tell the Harbor Office when you would like to use them. b. The fees for lockers vary according to the size. a. There are several metal baskets located in the harbor as garbage bins. b. Please separate garbage into “combustible wastes” and “cans and plastic bottles” as shown on the lids of garbage bins. If you need to discard large size objects, please consult the Harbor Office. Meeting rooms are available as below. Reservation is accepted two months in advance, but reservation for yacht racing will be given priority. *Please show your parking ticket to the Harbor Office, if you are harbor user. *Parking area is open from 5:00a.m. to 9:30p.m. b. No bicycle riding within the harbor. Park your bicycle at the parking lot. c. No BBQ, bonfire, or any other acts that use fire. d. No smoking except at the designated area. e. No fishing or swimming. f. Do not bring in any dangerous objects, including bottles, to the harbor area. g. Do not place any objects (boats, sails, bags, etc.) or work on maintenance of your boat/sail at the public space, including the pathways, slope and the Rest House. i. The dinghies and RS: X-class may not use pontoon to sail in and out. Use the slope at all times. j. Do not stay at the slope area for too long as the area tends to get crowded. Please sail out promptly. k. Do not moor coach boats or the like at the leeward side of the dinghy pontoon even temporarily. ①The leeward side must be kept open at all times for dinghies. ②At the second pontoon of the dinghy yard, please moor coach boats on the windward. Never make your boat stay at the leeward side! l. Coach boats and the like are not allowed to maneuver at a high speed within the harbor. Be sure to drive at a low speed at all times in the harbor. o. No drones are allowed without a permit from the Harbor Office. a. 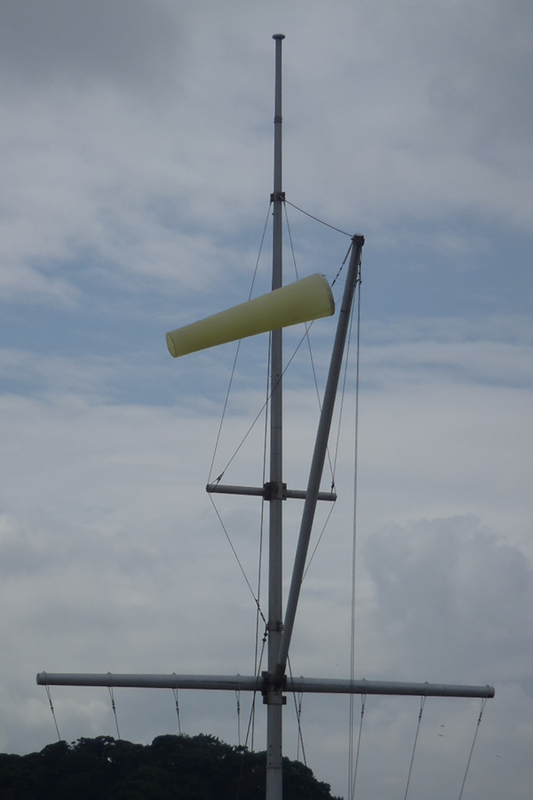 Warning about Weather Change: Yellow windsock is displayed on the mizzenmast located at the southeastern side of the harbor yard when the weather is worsening or expected to worsen (e.g. the maximum wind speed reaching 20knots, approaching thundercloud, dense fog or high waves). Sailors are advised to pay attention to weather change for their safety. b. 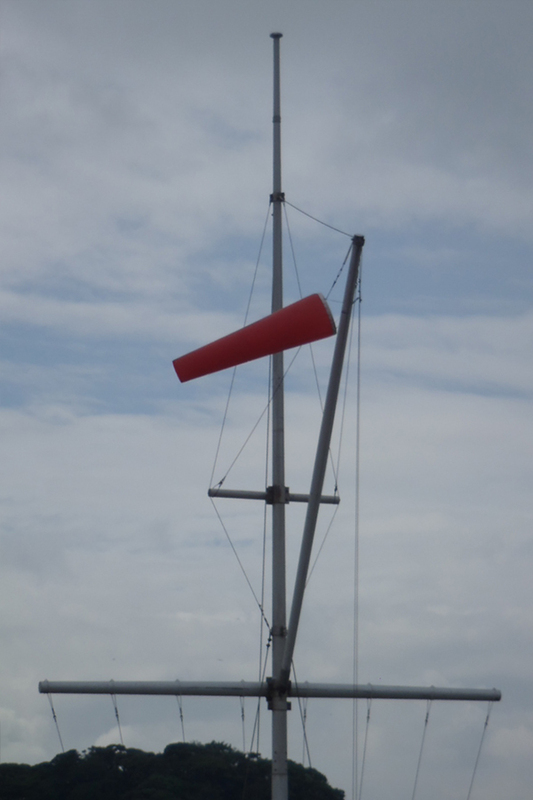 No Sailing Sign: Red windsock is displayed on the mizzenmast when the weather has worsened (e.g. the maximum wind speed reaching 25-26knots, occurrence of thunders, poor visibility and high waves) causing a dangerous state of sea surface. It is requested that sailors onshore not set sail and those sailing at sea return to the harbor. 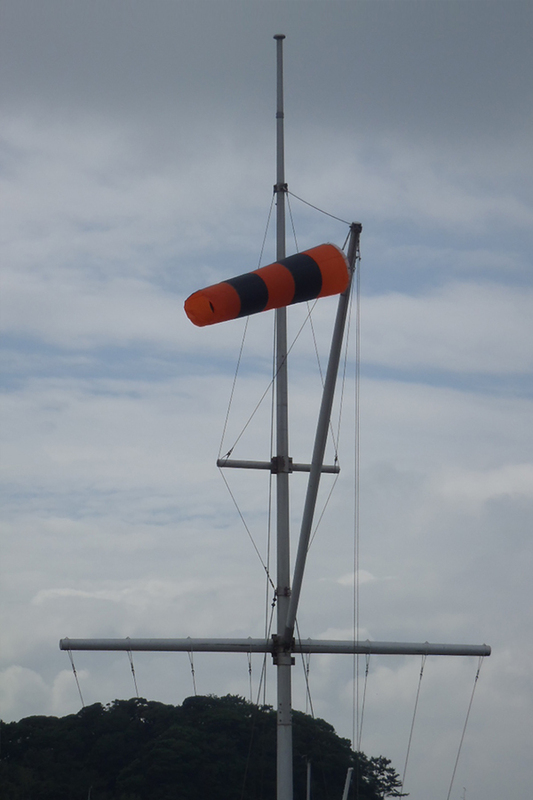 c. Tsunami Warning Alert: Orange-and-black-striped windsock is displayed on the mizzenmast when official Tsunami Warning Alert is issued by the Japan Meteorological Agency. ・Sailors onshore must follow the instruction of the Harbor Office staff and evacuate to higher ground. ・Sailors at sea will be alerted of the coming tsunami by sirens from the harbor and Coast Guard’s vessel. 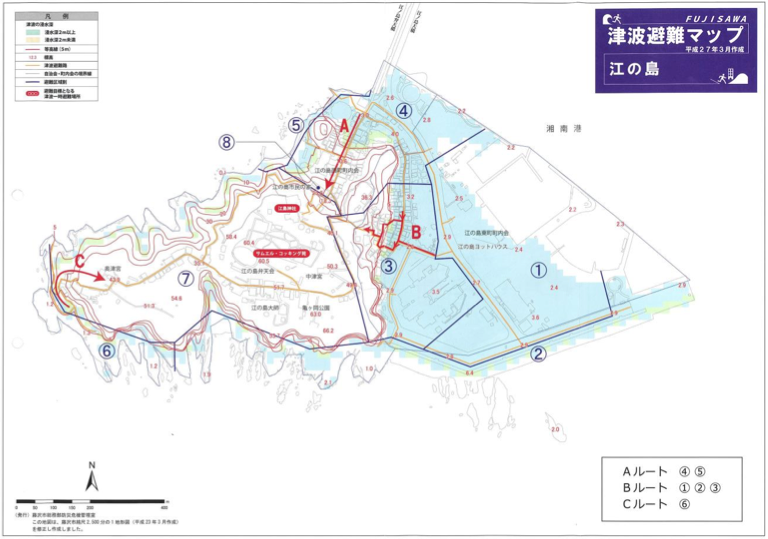 If there is enough time to return to the harbor according to the tsunami forecast, get back to the harbor as soon as possible (route B on following map) and evacuate to higher ground. When there is no time, keep sailing further offshore to evacuate. · Both “Warning Sign” and “No Sailing Sign” are for average sailors. · When top-level sailors with substantial experience wish to practice under the condition of strong wind, they must submit “Written Pledge for Special Practice under the Condition of Sailing Ban” to the Harbor Office before setting sail for practice. 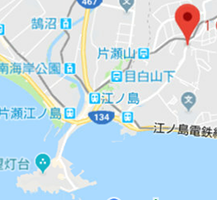 When a typhoon is anticipated to come close or hit the harbor area, it may be requested that the coach boats moored on water be moved to other area or on shore by crane. Please be sure to follow the instruction from the harbormaster to avoid any possible damage. Universal SOS call on VHS is the same Channel 16.